Swiss-Style Pork Chops, Thyme for Cooking gourmet recipes. 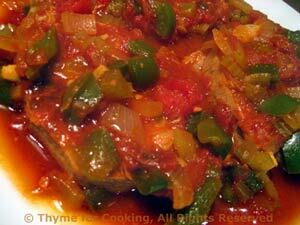 My mother made Swiss Steak when I was a child, and it was one of my favorites. Mon mari is not willing for me to bury steak in this type of sauce but pork chops are an excellent substitute. I don't have a crock pot (slow cooker) but I think this would be a good fit. I don't remember where I found this or why it's considered Hungarian... I've been making it forever; it's simple and delicious. Put in a steamer basket in a saucepan with an inch of water in the bottom. Put on medium heat and steam for 10 - 15 minutes or until done. Remove broccoli and cover with the pan lid to keep warm. In same pan melt the butter. 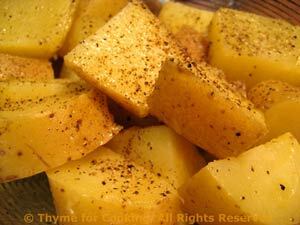 Add breadcrumbs, salt and sauté, stirring, until crumbs are golden, 2 - 3 minutes. 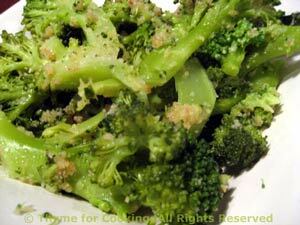 Sprinkle over broccoli and serve.